AquaMaster (Aqua Master) is recognized throughout the world as one of the premier manufacturers of pond fountains and aeration equipment (pond aerators). AquaMaster carries three lines of floating fountains: Masters Series, Classic Series and Celestial Series. In addition, AquaMaster has five different types of pond aerators and lake aerators: Oxymax Series, Ultimax Series, Volcano Series, Hydromax Series and the AquaAir Series. The AquaMaster Fountains (Aqua Master Fountains) Masters Series rely upon impeller technology, which allows AquaMaster to be one of the most powerful fountains in the 1/2 to 10 HP range. 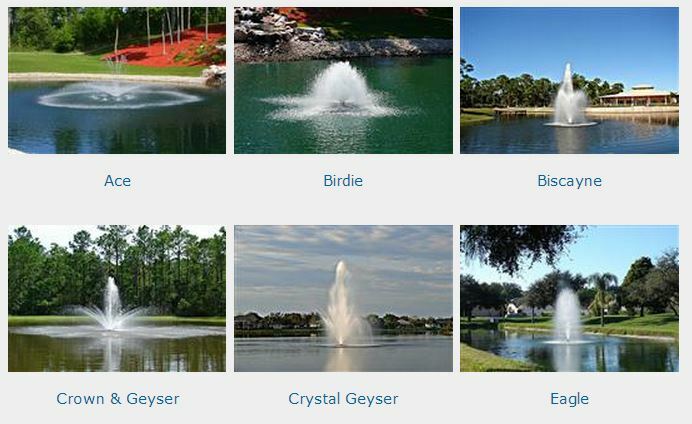 The Masters Series fountains for ponds and lakes are available in a wide variety of spray patterns. All Masters Series (except Captiva) are interchangeable and provide you with the ability to change spray patterns. This flexibility gives you the power to create dazzling waterscapes while improving water quality. The patterns for the Masters Series are as follows: Ace, Augusta, Bayside, Baytree, Birdie, Biscayne, Captiva, Champion, Crown and Geyser, Crystal Geyser, Cypress, Diamondback, Double Eagle, Eagle, Firestone, Geyser, Half Moon, Longbow, Medinah, Monterey, Par, Prestwick, Red Tail, Reflection, Sanibel, Sawgrass, Turnberry, Valhalla and Wide Geyser.